Normal Love, 1974, Handprinting and collage on paper, 8.75 x 9.5 inches. Artemis, 1983, Collage on paper, 56 x 20 inches, paper, 60 x 24.75 x 1.5 inches, framed. Mourning Women No. 3, 1989, Handprinting and printed collage on paper, 25-1/2 x 38-1/4 inches. 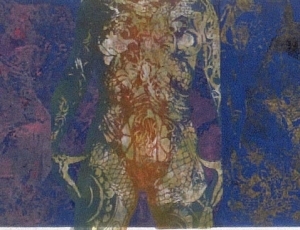 Vietnamese Women Totem, 1985, Handprinting and collage on paper, 110 x 20 inches. 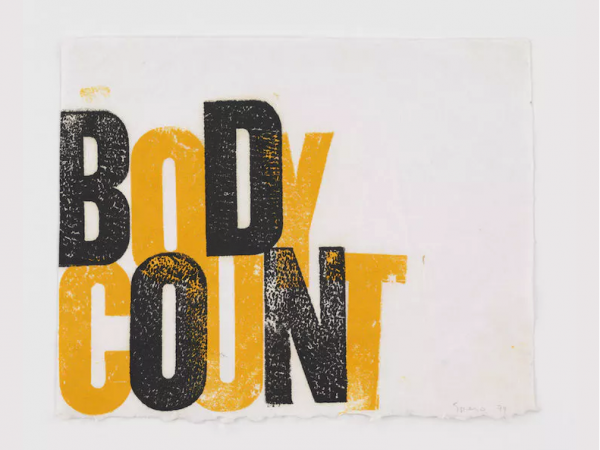 Nancy Spero (American, 1926-2009) was an American painter whose work is an unapologetic statement against the pervasive abuse of power, Western privilege, and male dominance. 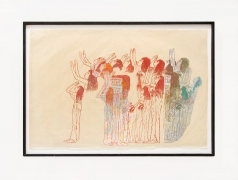 Executed with a raw intensity on paper and in ephemeral installations, her work often draws its imagery and subject matter from current and historical events such as the torture of women in Nicaragua, the extermination of Jews in the Holocaust, and the atrocities of the Vietnam War. Spero samples from a rich range of visual sources of women as protagonists—from Egyptian hieroglyphics, seventeenth-century French history painting, and Frederick’s of Hollywood lingerie advertisements. Spero’s figures co-exist in nonhierarchical compositions on monumental scrolls, and visually reinforce principles of equality and tolerance. She received a BFA from the School of the Art Institute of Chicago (1949), and honorary doctorates from the School of the Art Institute of Chicago (1991) and Williams College (2001). Spero was elected to the American Academy of Arts and Letters (2006). 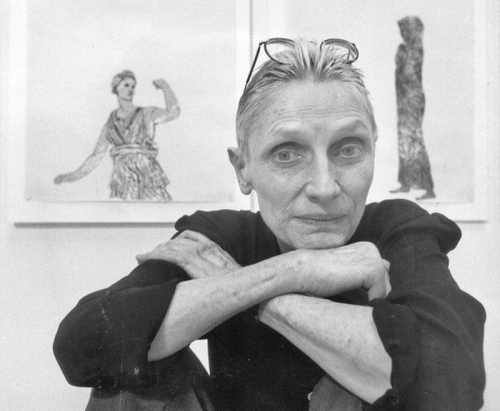 Awards include a Lifetime Achievement Award from the College Art Association (2005); the Honor Award from the Women’s Caucus for Art (2003); the Hiroshima Art Prize (jointly with Leon Golub, 1996); and the Skowhegan Medal (1995). Major exhibitions include Centro Galego de Arte Contemporanea, Santiago de Compostela (2003); Massachusetts Institute of Technology, List Visual Arts Center, Cambridge (1994); the Institute of Contemporary Art, Boston (1994); the Museum of Modern Art, New York (1992); and the Museum of Contemporary Art, Los Angeles (1988).